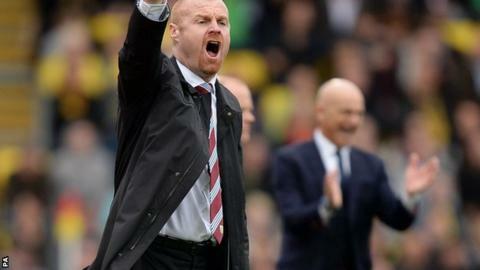 Burnley scored a late equaliser to draw at Watford and move a point closer to promotion to the Premier League. Troy Deeney had given the hosts an early lead with a superb strike from 25 yards but the Hornets were made to rue their failure to get a second goal. With four minutes left, Burnley's Scott Arfield turned on the edge of the area to fire a low shot past Manuel Almunia. Second-placed Burnley are now 10 points ahead of QPR in third with six games of the Championship season remaining. The Clarets, who last played in the Premier League in 2009-10, need three more wins to guarantee joining Leicester in winning promotion to the top flight. But Sean Dyche's side made a poor start at Vicarage Road as Deeney's 21st goal of the season put the hosts in front after nine minutes. Burnley thought they had levelled five minutes later when Ashley Barnes stabbed in Keith Treacy's cross but the goal was ruled out for a tight offside decision. Watford, who had midfielder Cristian Battocchio carried off on a stretcher after a collision with Ben Mee, nearly doubled their lead in the second half when Ikechi Anya rounded goalkeeper Tom Heaton but defender Chris Baird recovered to clear the winger's shot off the line. That proved crucial as Arfield twisted to create some space before shooting past Almunia for a dramatic leveller. "We've got a big game Tuesday and [the next game has] been our focus all year. We can only take care of what we do and not worry about everyone else. "I didn't think it was just battling, I thought it was real good quality. "I always feel this group has got a chance to get something from the game and we've done it again. It's another valuable point." "I did count 12 chances to score, including the goal, so I think the team did what I was asking. "Considering the team that we were facing, I'm very pleased about the performance." Match ends, Watford 1, Burnley 1. Second Half ends, Watford 1, Burnley 1. Attempt missed. Troy Deeney (Watford) right footed shot from outside the box is close, but misses to the right. Offside, Burnley. Ross Wallace tries a through ball, but Michael Duff is caught offside. Corner, Watford. Conceded by Brian Stock. Marco Davide Faraoni (Watford) is shown the yellow card for a bad foul. Substitution, Watford. Albert Riera replaces Lewis McGugan. Goal! Watford 1, Burnley 1. Scott Arfield (Burnley) right footed shot from outside the box to the bottom left corner. Assisted by Chris Baird. Attempt missed. David Edgar (Burnley) header from the centre of the box misses to the left. Assisted by Michael Kightly. Attempt missed. Daniel Pudil (Watford) left footed shot from the right side of the box is close, but misses to the right. Assisted by Daniel Tözsér. Attempt saved. Daniel Pudil (Watford) header from the centre of the box is saved in the top centre of the goal. Assisted by Lewis McGugan with a cross. Corner, Watford. Conceded by Chris Baird. Attempt blocked. Ikechi Anya (Watford) left footed shot from the left side of the box is blocked. Assisted by Lewis McGugan. Offside, Watford. Troy Deeney tries a through ball, but Marco Davide Faraoni is caught offside. Corner, Burnley. Conceded by Joel Ekstrand. Attempt blocked. Michael Duff (Burnley) right footed shot from a difficult angle on the right is blocked. Attempt saved. Ben Mee (Burnley) header from the centre of the box is saved in the top centre of the goal. Assisted by Michael Kightly with a cross. Corner, Burnley. Conceded by Troy Deeney. Substitution, Burnley. Brian Stock replaces David Jones. Substitution, Watford. Marco Davide Faraoni replaces Mathias Ranégie. Attempt saved. Mathias Ranégie (Watford) header from the centre of the box is saved in the bottom right corner. Assisted by Daniel Tözsér. Corner, Watford. Conceded by Tom Heaton. Attempt saved. Daniel Pudil (Watford) right footed shot from a difficult angle on the right is saved in the bottom left corner. Attempt blocked. Gabriele Angella (Watford) right footed shot from the centre of the box is blocked. Attempt blocked. Joel Ekstrand (Watford) right footed shot from the centre of the box is blocked. Assisted by Daniel Pudil with a headed pass. Attempt blocked. Ross Wallace (Burnley) left footed shot from outside the box is blocked.